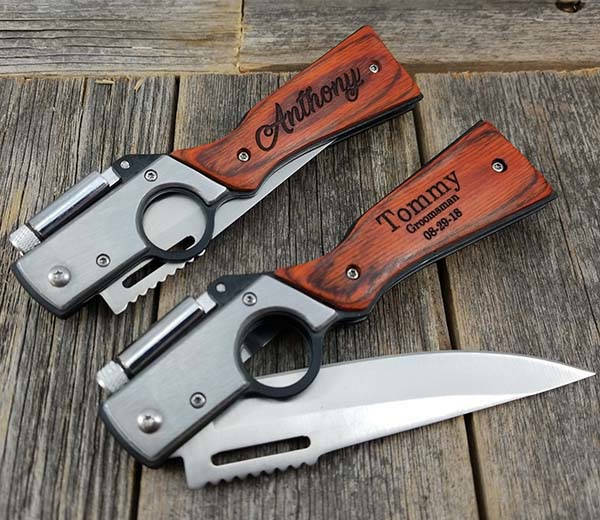 The handmade personalized gun-shaped pocket knife perfectly matches everyone’s personal style with engraved letters, and it has been ready to help you deal with some daily tasks. Like the idea? Let’s keep checking. This is a beautifully crafted and eye-catching pocket folding knife handmade by PersonalizedMoments1, a handicraft studio in New York. The pocket knife measures 9.5 inches long. When closed, it measures 5.5 inches long so that you can easily store it in your bag for any outdoor activity. As we can see from the images, the rifle inspired body delivers symbolic and exquisite detailing including wooden gun stock, trigger guard and more. The gun shaped pocket knife comes equipped with a 4.25-inch stainless steel blade to deal with various cutting tasks, and the rose wood handle lets you firmly hold it in your hand. Furthermore, the stainless steel knife also features an integrated small LED flashlight on the top for enhanced functionality. And there is a belt clip on the back preventing us from engraving. Moreover, the folding knife is customizable by engraving up to lines of letters on the front side of the knife for a personalized look. 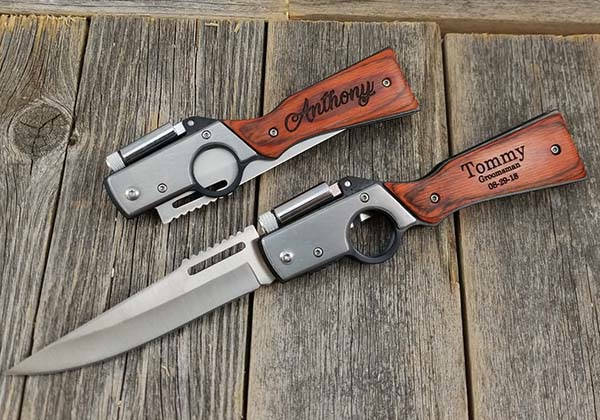 The handmade personalized gun shaped pocket knife with LED flashlight is priced at $19.99 USD. If you’re interested, jump to Etsy for its more details.